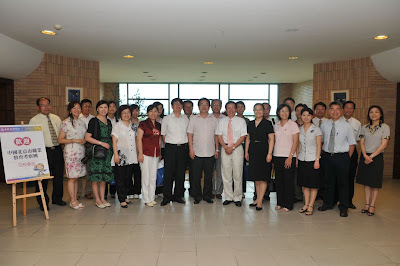 On June 11, Beijing Institute of Vocational and Technical Education, subordinated to the Ministry of Education of People's Republic of China (PRC), sent a visiting delegation of 15 Mainland Chinese school principals and affiliated researchers to Transworld Institute of Technology for academic exchange and cooperation. The delegation was cordially welcomed by President Dr. Shu-Hsiang Hsu, Secretary General Dr. Chien-Hua Shen, Dean of Academic Affairs Office, Dr. Wu Feng Shuai, Dean of Research and Development Office, Dr. Chin-Wei Liu, Dean of Student Affairs Office, Dr. San-Li Lin, Director of Center for International Affairs, Dr. Ying-Ni Chen, and respective higher-ranking chiefs and department chairpersons. 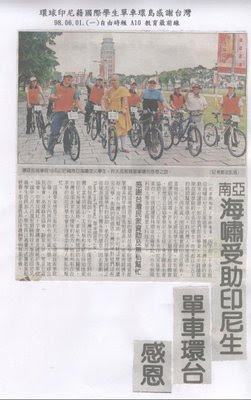 The delegation consisting of Principal SHI SHIAO HAO of Beijing Business School and Director LI HUAN GUI of Beijing Academy of Educational Sciences and other counterparts was led by Principal LIN AN JIE of Beijing Qiushi Vocational School under the arrangement of Secretary General LU HUI HONG of Taiwan Sino Education Interchange Association. President Hsu expressed his sincere greetings in welcoming the arrival of the Delegation, emphasizing that the University is ready for the launch of the market for prospective Mainland Chinese students as long as the Taiwanese Government passes the bill in the hope of proposing a win-win scenario in terms of vocational education for the Chinese-speaking community.